A trip to "The Land of Big" in Alberta, to see the largest pyrogy or some giant mushrooms, can be a great way to spend a day. Couple that with a trek down Alberta's largest completed section of the Trans-Canada Trail and you're set for a whole new adventure — one that's a short drive away. 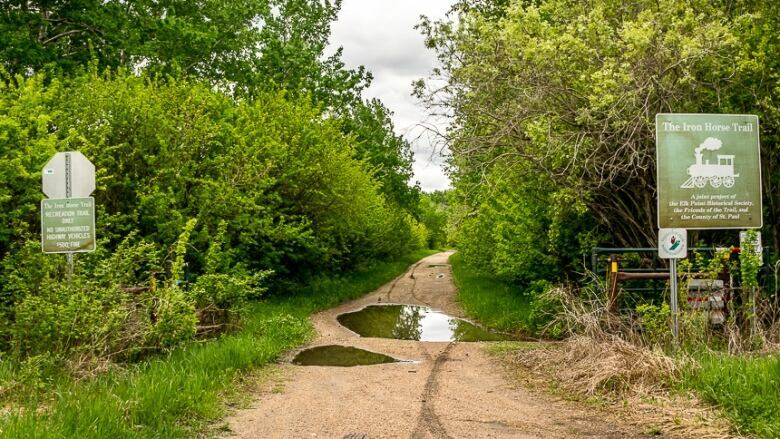 Leigh McAdam said most people may not have heard of the Iron Horse Trail, but its rich history is worth a trip to the start of it in the small community of Waskatenau, about 90 kilometres northeast of Edmonton. The Iron Horse Trail is 300 kilometres of developed trail and moves through Smoky Lake to Ashmont before splitting off into two parts: one section goes through Glendon and finishes in Cold Lake while the other goes through St. Paul and finishes up in Lindbergh. The trail is suitable for walking, as well as mountain biking, horseback riding and riding ATVs. Indigenous communities used the trail for generations before a train ran through each of the communities on the trail, starting in 1927. But once CN stopped using the railway and began pulling up their tracks, the neighbouring municipalities decided to do something about it. "Based on that, the communities decided they've got this overgrown but very well-grated piece of real-estate that they should do something with," McAdam, who writes a blog called Hike Bike Travel, told CBC's Radio Active. In 1999, the 10 municipalities in the region decided to preserve the trail for people to enjoy. Each community boasts pieces of history — like Vilna's old pool hall, the Métis crossing near Smoky Lake or the Heinsburg water tower. McAdam recommends taking a mountain bike through the trails. Some parts can be challenging, she said, as most of the trail is gravel. But the scenery alone makes it worth it. "This is a trail that you can expect to see nature on," she said.